This year’s edition, the 24th Conference of Parties (COP24) is taking place in Katowice, Poland from December 2 to 14. Among the 25,000 participants, our Director of Government Relations, Annie Bérubé and our Executive Director, Sidney Ribaux, are in attendance to help move our governments toward ambitious, collaborative, game-changing action to ensure that we keep our planet below 1.5°C of warming. Why is this COP so important? Three years after the COP that paved the way to the Paris Agreement, for which governments agreed to pursue a warming limit of 1.5°C above pre-industrial levels, the latest Intergovernmental Panel on Climate Change (IPCC) report has confirmed that current commitments from UNFCCC Parties to reduce greenhouse gas emissions are no way near ambitious enough to reach that goal. COP24 is a critical political moment for Parties to the UNFCCC to show their collective commitment to climate action and affirm their intention to hold global warming to 1.5°C. 2018 is also a critical year for the Paris Agreement, as all the rules and regulations must be finalized by the Parties for its implementation in 2020. Why do we need to limit planetary warming to 1.5°C? Our planet is now 1°C warmer than it was before the Industrial Revolution, when greenhouse gas emissions began to increase significantly. The IPCC report explains that though another 0.5°C will increase widespread impacts and losses, limiting warming to 1.5°C instead of 2°C would make a huge difference to reduce further risks regarding weather extremes, species loss, water scarcity, food shortages, heat-related deaths, sea level rise, and so on. 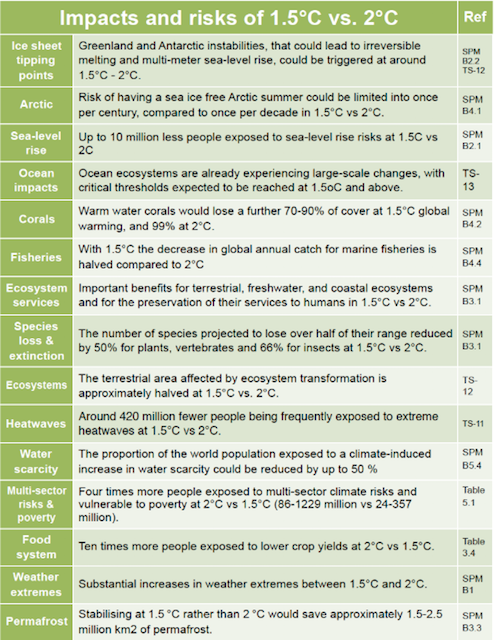 The following table by Greenpeace International summarizes the difference. What are our expectations of the Government of Quebec? Make financial contributions for climate adaptation in Francophonie countries. What are our expectations of the Government of Canada? The Canadian Government must show leadership at home and on the international scene. Not only is Canada’s current target of reducing emissions 30% below 2005 levels by 2030 insufficient for the 1.5°C goal, but we are not on track to reaching that target. With the global stocktaking exercise, Canada will explain what has been done up to date to address climate change. Canada will participate in the Talanoa Dialogue, which is intended to ratchet up ambition to get us to where we need to go to limit warming to 1.5°C. Canada will play a role in finalizing the Paris rulebook to ensure that the Paris Agreement is implemented in 2020. Canada will be a part of discussions around a just transition towards a clean energy future. Canada will address its commitment to climate financing for communities who are bearing the brunt of climate change. What role does Équiterre play at the COP? It is imperative that Quebecers and Canadians be informed about the progress that the Parties are making towards determining the future of our planet. Équiterre is at COP24 to report on what is taking place and as a reference for Quebec and Canadian media outlets. Équiterre is one of the few Canadian environmental organizations that has access to the negotiations. We will therefore be following them closely and reporting back to our Canadian colleagues from other organizations. With a large Canadian and Quebec delegation, COP24 is an opportune place for us to meet with government representatives and our colleagues from other organizations to move things forward. What will determine if this COP is a success or not? The Paris Rulebook must be finalized, so that the Paris Agreement can be implemented as planned in 2020. Parties must increase their ambition for their Nationally Determined Contributions (NDCs) for reducing greenhouse gas emissions to the point that limiting warming to 1.5°C is achievable. Parties must reach a consensus with national commitments for climate financing for communities most affected by climate change. Follow Équiterre at COP24 on Facebook, Twitter and Instagram for the latest updates.